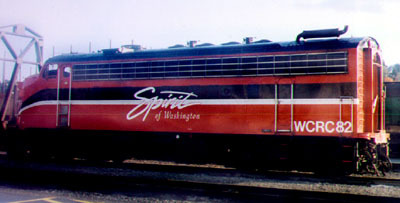 Though it no longer exists as a corporate entity, the Washington Central lives on in the memories of railfans, and in a surprising number of locomotives around the state. Following the Burlington Northern merger in 1970, the new railroad looked to save money by abandoning duplicate routes wherever possible. At the time the new road had three routes over the Cascades from Spokane to the port cities of Seattle and Tacoma. These were, from north to south, the Great Northern's line over Stevens Pass, the Northern Pacific's Stampede Pass route, and the Spokane, Portland and Seattle water level route along the Columbia River. The BN decided to axe the more rugged Stampede pass route and the line was abandoned and removed in 1983. The eastern end of the route from Ellensburg to Pasco remained as a branchline to serve predominantly agricultural shippers in this fertile region of the state. In a further attempt to streamline operations this line and several branches connected to it were put up for sale a few years later. The Washington Central Railroad (Reporting mark WCRC) was formed in 1986 to operate this branch, and to serve as a feeder to the BN at Pasco. In addition to the main line from Pasco to Cle Elum, the WCRC also served branch lines to Grainger, Moxee City, and several other small towns in the region. A few months after it's creation, the new road inherited several former Northern Pacific and Milwaukee Road lines, and also began operating the government owned railroad on the Hanford Nuclear Reservation. In time, the road became well known for it's distinctive red locomotives, each bearing the "Seahawk" on their side. There were also thousands of WCRC freight cars, including many box cars and centerbeam flats. The road derived a substantial part of itÕs income from leasing these cars to other roads in what is known as an "incentive per diem" arraingement. Despite it's shortline status and it's beginnings from a remnant of the second transcontinental line, the WCRC did very well, offering the sort of local oriented service that the BN was unable to match. Change, like death and taxes, is inevitable, and the looming merger a decade later between the Burlington Northern and Santa Fe was about to bring some big ones to the little shortline. Shortly after the BNSF merger in 1996 was consummated, the new railroad went looking for ways to increase capacity between their major classification yard in Pasco WA and the Puget Sound ports. 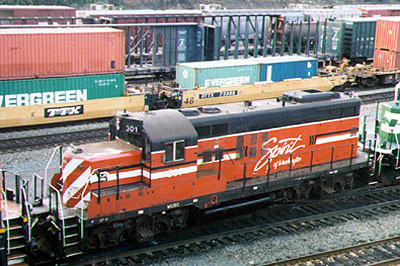 Increasing intermodal traffic in the early 90s had pushed general freight off the rugged Stevens Pass route, and heavy grain and mainfest traffic was beginning to clog the former Spokane, Portland and Seattle river line. Several proposals were considered, including re-laying track on the old Milwaukee Road Snoqualime Pass line, but in the end the decision was made to reactivate Stampede pass. Only problem was, BNSF didn't own the eastern end any more! Negotiations were begun with the Washington Central for trackage rights, but these soon broke down. Running out of time and at a loss for what to do, BNSF CEO Rob Krebs announced that the BNSF was going to buy the little short line, lock, stock, and locomotives. Today the WCRC is yet another fallen flag, but in some unexpected corners of the northwest, the flag still flies. Probably the best known remnant of the WCRC are the locomotives that power the Spirit of Washington Dinner train. WCRC 82 is a EMD F9A fitted with a diesel head end power unit in place of it's steam generator. This unit still runs several times a week throughout the summer, giving passengers a rare taste of railroading in the streamliner era. The above picture was taken at Interbay yard in Seattle, where the unit is serviced by the BNSF shop forces. 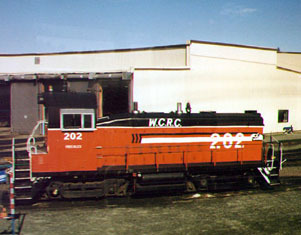 WCRC 301 is a rebuilt GP9 and can still be found working the Hanford Reservarion near Richland WA. She was recently featured in a photo in Trains magazine shoving over 50 retired BN B30-7AB locomotives onto a storage track at Hanford. Once again, she is seen here at Interbay for maintainence. Probably the most interesting afterlife for a Washington Central unit is that which befell the WCRC 202, more commonly known as "Freckles" for reason which remains a mystery to me. This diminutive little switcher moved permanently to the cold climate of Seattle to become the turntable switcher at Interbay yard. As more and more of the smaller BN switchers were retired through the 80s and 90s, the BNSF found itself in need of a locomotive short enough to fit on the turntable with a larger road locomotive dead in tow. The solution came with the purchase of the Washington Central, and ever since, "Freckles" has faithfully shifted the weary giants around the roundhouse tracks at Interbay.